Approximately 90 members of the Experiment Station Section gathered in Lincoln Oct. 1-3 to discuss the importance of pursuing partnerships in agricultural research. Lincoln, Neb. — The Agricultural Research Division at the University of Nebraska–Lincoln hosted the annual meeting of agricultural experiment station leaders from across the country Oct. 1-3 in Lincoln. 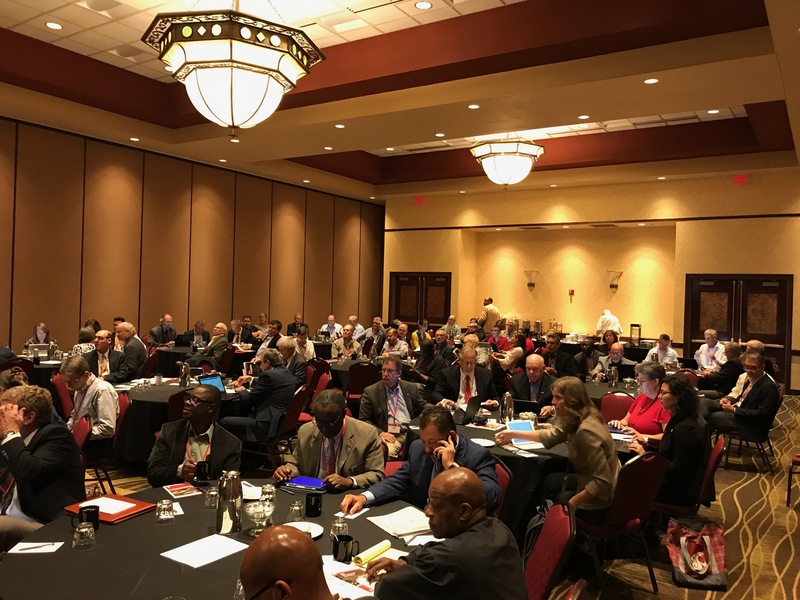 The meeting brought together approximately 90 members of the Experiment Station Section (ESS), which is a unit of the Association of Public and Land-grant Universities (APLU) Commission on Food, Environment and Renewable Resources, Board on Agriculture Assembly. Members are the designated administrators of the agricultural experiment stations at land-grant universities in all 50 states and US territories across the 1862 and 1890 Land-grant Institutions. Each station participates in a regional association, with Nebraska residing in the North Central Regional Association. Nebraska’s Deb Hamernik, associate vice chancellor for research, served as the meeting co-chair as her first activity as the elected national chair of ESS. In her opening remarks, Hamernik, a professor of animal science and prior associate director of the Nebraska Agricultural Experiment Station, spoke on the critical importance of pursuing partnerships, which served as the theme for the conference. “In the face of flat or declining state support, future funding for agricultural research in many states will require a unified voice from leaders of agricultural experiment stations as well as new and traditional advocacy groups. Agricultural experiment station directors must provide leadership to work with advocacy groups and new and traditional sponsors of research to create innovative funding opportunities to sustain agricultural research programs and solve today’s challenges,” Hamernik said. The meeting featured sessions spanning a wide variety of topics, including a keynote presentation from Greg Perry, professor in the Department of Agricultural and Resource Economics at Colorado State University on state funding for agricultural experiment stations. State funding for agricultural experiment stations reached its peak nationally in the 1990s and has been trending downward since, although there is considerable variation state-to-state. In what Perry called the most impactful research he’s conducted in his career, he detailed a study identifying some of the political-economic factors that have driven funding growth and declines. “I cannot overemphasize the importance of engagement in the political process by experiment station leadership,” Perry told the group. Additional speakers addressed how advocacy groups and leaders from agricultural experiment stations can work together to communicate a unified message in support of agricultural research, potential research partnerships that may diversify the funding portfolio for food and agricultural research at land-grant universities and strategies for leaders to reinforce an inclusive climate that supports a diverse workforce and campus community. In addition, meeting attendees had the opportunity to tour Nebraska Innovation Campus and the field phenotyping facility at the Eastern Nebraska Research and Extension Center near Mead, Neb.